In 1967, Roger Ebert was asked to review movies for the Chicago Sun Times. He soon became one of the best loved, most respected film critics in America. He wrote many books about film and was one half of the hugely popular Siskel and Ebert At The Movies television show. Ebert won a Pulitzer Prize for Criticism in 1975, is the only film critic with a star on the Hollywood Walk Of Fame, was named honorary life member of the Directors’ Guild Of America and won the Lifetime Achievement Award of the Screenwriters' Guild. However, he is best remembered for his wonderful reviews. While these reviews could be harsh, they were always an honest and extremely well argued. If I could a fraction as well as Roger Ebert, I would be a happy writer indeed. Having been a journalist all of my working life, I am inspired by writers who can combine words and express thoughts in a way that (for me) seems beautiful. Roger Ebert is one of my inspirations. Not just because I am passionate about film but because I am passionate about writing. Ebert’s reviews are often the first I read after watching a film. What did Roger think, I wonder. For example, having just watched Terrence Malik’s The Tree Of Life I was left with many complex thoughts swirling around my head. I looked to Roger as a means by which to anchor myself. And he didn’t disappoint. Indeed, his review was so moving that it had me in tears. Now, how often can you write that about a movie review? Click here to read Roger's review of this film. As a result, I was hardly impartial as I watched Life Itself. I was always going to love this documentary. And I did. I really enjoyed hearing from Roger’s friends and colleagues. I was impressed all over again by his work and I loved watching him and Gene Siskel do battle both on screen and off. While I watched Life Itself hungry for an insight into an incredible writing talent, I think Roger Ebert consented to the project for an entirely different reason - to document his illness. In 2002, Ebert was diagnosed with thyroid cancer and salivary gland cancer in 2003. Then, in 2006, doctors found cancer in his jaw, which led to an operation to remove the lower part of his jaw. Life Itself director, Steve James, was allowed access to Ebert in his hospital room. This footage is extremely tough to watch. I started to feel that the filming was becoming intrusive - until I realised that Ebert wanted this part of his story to be told. The film suggests that Ebert’s motivation for this stems from his shock and distress at not knowing about Gene Siskel's battle with brain cancer. Siskel died in 1999 and, at that point, Ebert decided that he would never keep an illness secret. As a result, we see Ebert at all stages of his life. He does not shy away from the camera or his audience because of cancer. Indeed, at one point he seems happy that a frankly awful suctioning procedure had been successfully captured on film. In these darkest of moments, Ebert is truthful to his audience and shows them that, while, cancer can be ugly and is often horrific, it is also possible to live a rewarding life. I found this to be so inspiring. Ebert cannot speak but his voice can be heard loud and clear as he continued his writing. There are times when his body just looks so broken but his eyes are shining. The documentary shows how Ebert owed much of his strength to the support he received from his family and his wife, Chas, in particular. Their relationship is beautiful and so moving - particularly in the final stages of the film when she realises that she has to let go of the man she loves. I would highly recommend Life Itself. It gets a resounding two thumbs up from me. 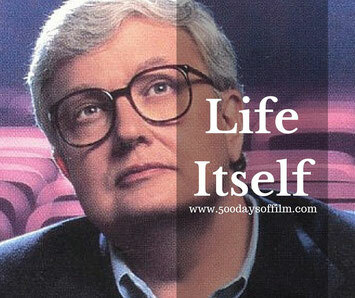 Life Itself is based on Roger Ebert’s memoir of the same name. I love Werner Herzog in this film. Roger Ebert was ahead of his time in so many ways - he was one of the first critics to understand the potential of the internet for film criticism. His website (rogerebert.com) is a phenomenal resource. I often visit to check out his reviews and the thoughts of the critics that continue his legacy. Have you seen Life Itself? Did you enjoy it as much as I did? I’d love to know your thoughts on this documentary. Leave me a comment in the box below!